This entry was posted on June 18, 2009 at 11:15 am	and is filed under Morality, Opinion, Politics, Religion, Scandal, Skeptics, South Asia, Spirituality, Trends, Uncategorized, World Issues, World Religions. 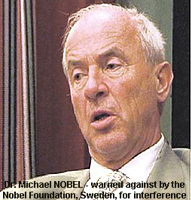 Tagged: Autocracy, Dr Geir Lundestad, Dr Michael Nobel, Nobel Institute, Nobel Peace Prize, P.N. Bhagwati, Press Trust of India, Sathya Sai Central Trust, SBS, Scientology, Seduced, T.Sri Ramanathan, The Times of India, UNESCO Media Advisory, WorldSpace, WorldSpace International Satellite Radio Service. You can follow any responses to this entry through the RSS 2.0 feed. You can leave a response, or trackback from your own site.